Spiritualism, the idea that one can communicate with the spirits of the dead, had been around since the nineteenth century thanks to the worldwide sensation caused by the American Fox sisters who were able to speak with the deceased and receive replies through their rapping sounds. Except of course they couldn't, their fame was built on a lie and any knocking to be heard during their shows was the cracking of their toes (! ), but the idea was so attractive that by the early twentieth century there was one major reason why spiritualism and mediumship had become enormously popular: millions of people were dying. The practice grew in importance from starting as a charade designed to fleece the gullible to a genuine comfort to countless of the bereaved across the globe (though it may arguably have still been a charade to fleece the gullible, and continues to this day). Sherlock Holmes creator Sir Arthur Conan Doyle was a fierce proponent of spiritualism since he had lost his son in the First World War, no matter that it led him down some embarrassing cul-de-sacs, and once the Second World War had exploded in 1939, once again thoughts had turned to the possibility of not merely an afterlife, but evidence that souls prevailed and were able to exist onwards. Naturally, the popular culture of the time reflected this like never before, and musings over ghosts made for substantial hits at the box office. Previously, they had been the subject of comedies predominantly but once The Uninvited arrived, the initial major success to reflect how the public were growing inescapably morbid, and understandably so, the floodgates opened and we can see its effects of taking phantoms seriously down the decades to the supernatural hits of the twenty-first century. 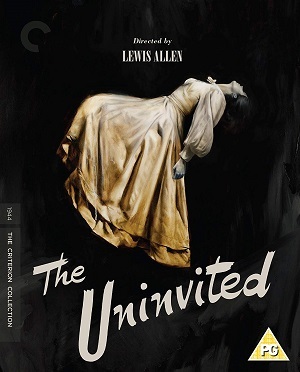 While The Uninvited set out to scare its audience, however, it was different from the monster movies that had previously rung the box office tills in the thirties. Indeed, there were times where it almost came across as a comedy itself, not hilariously so, but including nervous, breezy humour mostly for its stars Ray Milland and Ruth Hussey to essay, playing a brother and sister who up sticks and move from London to Cornwall and a lovely old house there that lies mysteriously empty - and is priced equally mysteriously cheaply. Such is the premise of many a ghost story, and they soon discover in eerie sequences that there is a presence within its walls, an unquiet one that draws a young woman who lives nearby and has a history with the place thanks to her mother having lived there in the woman's early years. That woman is now, in retrospect, the real ghost in The Uninvited, for she was the first starring role for Gail Russell, the tragic actress who may have been exquisitely beautiful, but was agonisingly sensitive too, a quality that was detectable in her appearances and has won her a cult following ever since. She had only agreed to be an actress to provide for her poverty-stricken family, the studio deciding, more or less, who cares if she could act when she looked like Hedy Lamarr, and taking not a whit of attention of her obvious discomfort in the spotlight, her crippling shyness rendering her the worst choice to pursue acting as a career (she would have preferred to be an artist). She has received various degrees of scepticism as to her aptitude at performing over the years, but like many a celebrity who suffered for their art, it has lent Gail a glamour that has hearts going out to her wherever her sad story is read about. She would die aged thirty-six, her film career long since dwindling into B-movies and her looks lost to alcoholism, but The Uninvited, having captured her at the height of her melancholy allure, continues to bewitch many who watch it. It was, after all, a film steeped in death, and now all concerned in its manufacture are gone, it lives on curiously alive after their passing, its mix of tones and truly powerful fears for the Russell character hard to shake. By the second half of the forties, as the planet came to terms with the horrors of the recent war, the supernatural pictures kept arriving as the public lapped them up, including comedies and more serious efforts; Michael Powell and Emeric Pressburger's A Matter of Life and Death addressed the conflict directly and sought to provide comfort for the millions who had lost loved ones, and It's a Wonderful Life appealed to the contemplation that inevitably arose. The ponderings on what it was all for, the meaning of life, were summed up in James Stewart's anguish that his existence had been pointless, and Frank Capra's endeavours to insist everyone had worth. That was for the men who had witnessed the death and destruction, even taking part in it themselves, but now the war was over what of the women? 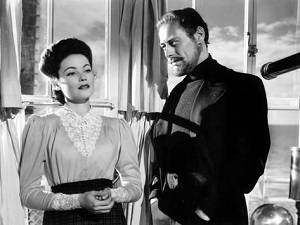 The Ghost and Mrs. Muir took place in Edwardian England, but like The Uninvited (which was set in the thirties) it had a coastal location, and both films opened with waves crashing onto rocks at the shore. You could observe they went in separate directions after that, but each were obsessed with the influence the dead have over the living, and Gene Tierney's title widow started out trying to escape the grasp of her deceased husband's family by buying a house on a cliff for herself and her little daughter to stay in. The daughter was played by Natalie Wood, who would go on to her own tragic demise once she grew up, and like Gail Russell suffered her own anxieties though was able to suppress them in front of the cameras. Yet Tierney was only a short while away from her own breakdown as she contracted measles while pregnant, and the awful effects it had on her child psychologically damaged her terribly: she was said to be never quite the same after that, though she did make a return to the screen eventually. It seemed with these ghost movies, a real-life tragedy would either inspire them or affect someone involved in their manufacture. But Mrs Muir was not the ghost here, Rex Harrison played the supernatural resident of her new home and he was a salty sea dog who lamented the idea his death was listed as suicide - it was an accident, he insisted. You could either read the ghost, Captain Gregg, as an actual spirit or as the figment of the lonely Mrs Muir's imagination, someone to keep her company as a fantasy husband who she never even kisses, thanks to his lack of a corporeal form. When a suitor turns up in the shape of that old smoothie George Sanders, an unlikely author of children's books, Gregg bristles, correctly as it turns out, for the sole person suitable for her is himself. If you muse over the consequences of this, they become both pertinent to the times they were created in and one of the saddest elements of a genre that gave itself up to the promise of the afterlife since the real world was too difficult to contemplate happiness in. When Gail's Stella obsesses over the dead, we know she must be liberated by the living if she can ever hope to exist normally, but Mrs Muir waits endlessly for her beau, knowing that, as many of the world's bereaved did, there will always be something - someone - missing in her days and years that will never be returned to her since, to use a nautical term, that ship has sailed. 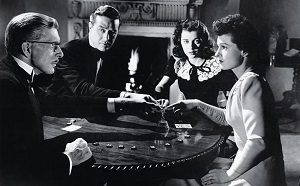 That is if you don't believe in life after death: the moving conclusion was unexpectedly profound after what was often a frivolous film, for a Joseph L. Mankiewicz-directed work that was (he did not pen the script, however, Philip Dunne did), but the ending was fitting for his style and themes. Just as in The Uninvited, living for what might have been is the same as biding your time before you pass away, and in Hollywood heaven you might receive your just reward if you wish and hope for long enough. We can only hope Gail, Natalie and Gene did, and their films are a record that they existed and can be appreciated after they've left us in body: in spirit they will be around as long as people watch old movies.